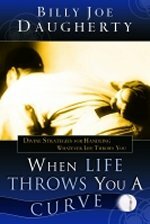 Description: Divine Strategies for Handling Whatever Life Throws You. Most kids growing up in America —male and female—spend at least some time playing baseball or softball. Even if they do not play in a formal league, they usually play in their yard with plastic bats and balls. As I was thinking about writing this book, I thought about my own years growing up playing Little League and then American Legion Baseball. One of the most challenging things was learning how to hit a curve ball when I was just a young teenager. I remember how I could hit the straight pitches easily, and in Little League, that was all pitchers were allowed to throw. They would not let the Little League pitchers throw curve balls. When the pitch came—we called it a fast ball—it came straight across the plate and it was very easy to hit.